Lock in a great price for Port Hughes Tourist Park – rated 8.5 by recent guests! great location and proximity to facilities and beach. Be good to get one of your units closer to the beach. He tavern provided great food at affordable prices. The kitchen in the villa had all appliances and facilities needed. Close to the beach, nice and clean environment, good facilities. The extra comfy bed the beach near by and the deck (the restuarant). Location was fantastic - great beach & easy walk to the local tavern/general store. Cabin was comfortable - good air conditioning, kitchen facilities, comfy bed & great theatre chairs! We loved the view from the boardwalk down to the beach. There was a lovely family atmosphere in the park. I stayed in one of the ocean view cabins and loved the view and the close proximity to both the jetty, the local store and pub. The cabin was well set up and appointed and very clean. Very clean Cabin .The bed was so comfortable, I had the best sleep since a long time. 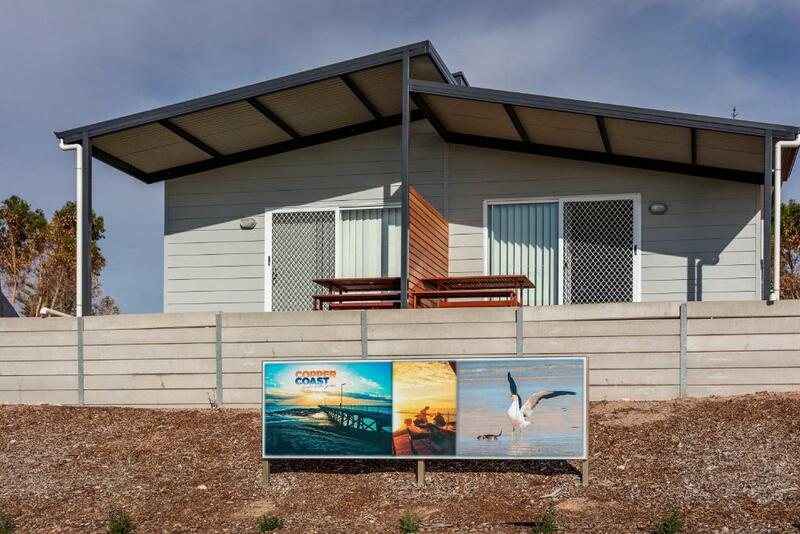 Located in Port Hughes, 14 miles from Wallaroo, Port Hughes Tourist Park has barbecue facilities and free WiFi. All units feature air conditioning and a TV. Some units also have a kitchen equipped with an oven and a microwave. The resort village has a playground. When would you like to stay at Port Hughes Tourist Park? This family room has air conditioning, kitchenware and microwave. This family room features a DVD player, stovetop and kitchenware. This suite has a balcony, stovetop and kitchenware. House Rules Port Hughes Tourist Park takes special requests – add in the next step! Up to three children under 16 years are charged AUD 13 per night when using existing beds. Port Hughes Tourist Park accepts these cards and reserves the right to temporarily hold an amount prior to arrival. If you expect to arrive after 18.00, please contact the property using the contact details found on the booking confirmation. The night we were there it was blowing a gale and something was clattering on the roof so we didn't sleep as well as we might have. Fabulous view, very well-appointed cabin. The 2 single beds made together to make a double bed, most uncomfortable sleep ever in my life. The brand new sea view villa. None of that I can think of. The money you pay is not what you get. Overpriced for a caravan park. Service was poor, promises to get back in contact not done. Cabin was mediocre, could see nails protuding from panels. Nothing apart from the road out. The bathroom wasn’t cleaned out properly. There was mould and soap scum in the shower, and the shower only had two temperatures -too hot or too cold. The bathroom made me wonder where else corners were cut in terms of cleaning. The office staff were very lovely. The grounds were clean and tidy and obviously well looked after. the beds were not terribly comfortable.. really really firm. Also given the weather, would have been good for someone to turn on air con prior to arrival.